Always wanted to pick up playing the drums? In just 11 short weeks, you can. Level I is specially designed for the total beginner. Covering the basics of note reading and rhythmic grooves while bypassing the tedious routine of conventional music courses, play and sing radio hits of the past and present. Impress your loved ones with the speed and ease at which you can start playing music. Sign up today and begin this very special musical journey with us. The main theme centers on THE STORY OF MANKIND – a revealing epic adventure that will take you from the unspoken pasts of humanity (World History) to current-day state of affairs and beyond. Come away with a worldview that promises to never leave you the same again. ii) Wish to relearn the fundamentals of playing drums especially posture, stick handlings and stroke dynamics. This will help you to develop your playing further. This step-by-step course is designed for total beginners who have absolutely no prior knowledge in music or the drums. Individuals who attended other courses but still find themselves unable to play confidently, are advised to join this Level I Module. What do I learn in 3 months? Conducted in small groups (i.e. 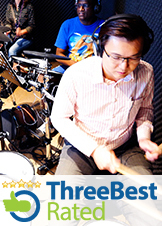 3-4 persons), the 1 hr per week sessions include: INTRODUCTION to the drums and its role in a band – Reading DRUM NOTATION – DRUM RUDIMENTS exercises to build a strong foundation in playing drums - Enhanced Techniques INTERACTIVE Music Exercises (Ensemble style). I had some drums lessons previously. Do I still have to attend this module? If you don’t know how to read Drum Notation/Scores then you have to go through this module as it is one of the requirements for the higher modules. Since classes are done in a group setting, how is the practice like? Each student has an electronic drum kit to use in class. Each of these drum kits are connected in such a way that a student can listen only to his sound during individual practice, but also listen to the coach whenever instructions are given. Acoustic and Electronic Drum kit...What's the difference? The list is long when it comes to the differences between Acoustic and Electronic Drum kit. But the most important differences are as follows; 1) SOUND CONTROL - Acoustic Drum kits are loud while Electronic Drum kits allow headphones. This enables you to play freely without the worry of creating excessive noise. 2) RECORDING – Electronic Drum kits come with a USB port connected to a computer, making the recording a lot easier. 3) SONIC VERSATILITY – Electronic Drum kits are pre-loaded with different drum kit sounds (i.e. rock kits, house kits, percussion kits etc. ), enabling the student to customize sounds for different musical genres.